Facts or fiction about IceLink? 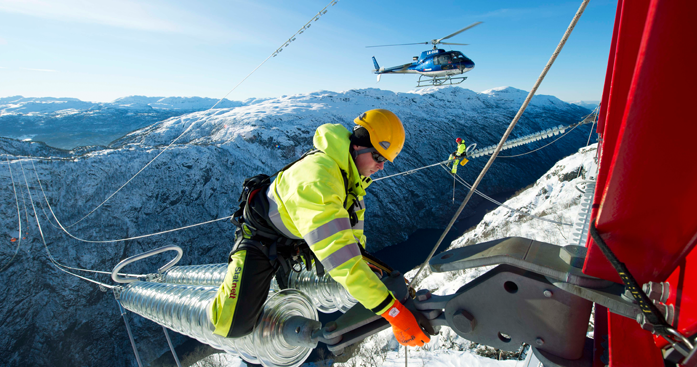 Claim no.1: IceLink lifts the isolation of the Icelandic electricity market and it assists Europe to achieve interconnection capacity targets amounting to 10% of installed capacity, and it opens up new markets for both Icelandic and UK suppliers. Correct: The Icelandic power market is isolated. With IceLink, that would change. 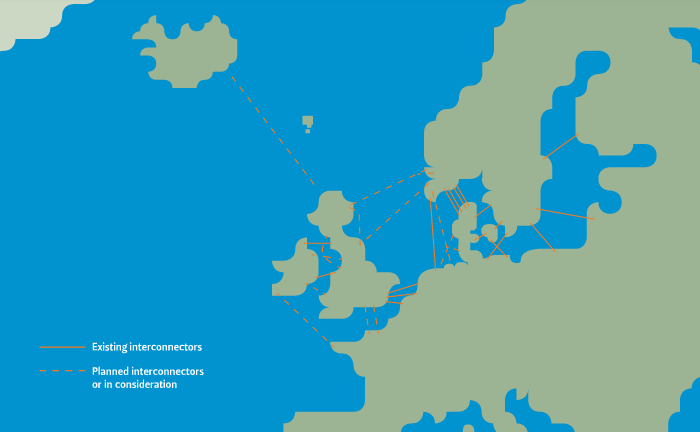 Correct: IceLink would be part of Europe’s projects to achieve interconnection capacity targets. Correct: IceLink do open up new markets for Icelandic and UK suppliers. The EU Commission has set a target of 10% electricity interconnection by 2020. This means that all EU countries should construct electricity cables that allow at least 10% of the electricity produced by their power plants to be transported across its borders to its neighboring countries. However, IceLink will not be ready by 2020. Thus, it seems likely that the IceLink project would rather become a part of EU’s new energy policy and targets for 2030. In fact, this development or process has already started. The EU Commission has already proposed to extend the interconnection target from 19% to 15% by 2030. The targets will be reached through the implementation of Projects of Common Interest. A new special expert group on electricity interconnection targets established by the EU Commission had its first meeting in Brussels on 17th and 18th October 2016. It is yet to be seen what will become the new interconnection target for each of the EU member states, but so far the UK’s share is only less than 5%. In 2015 domestic installed capacity in GB was 91 GW, while total capacity of interconnectors between UK and other countries was 4 GW. 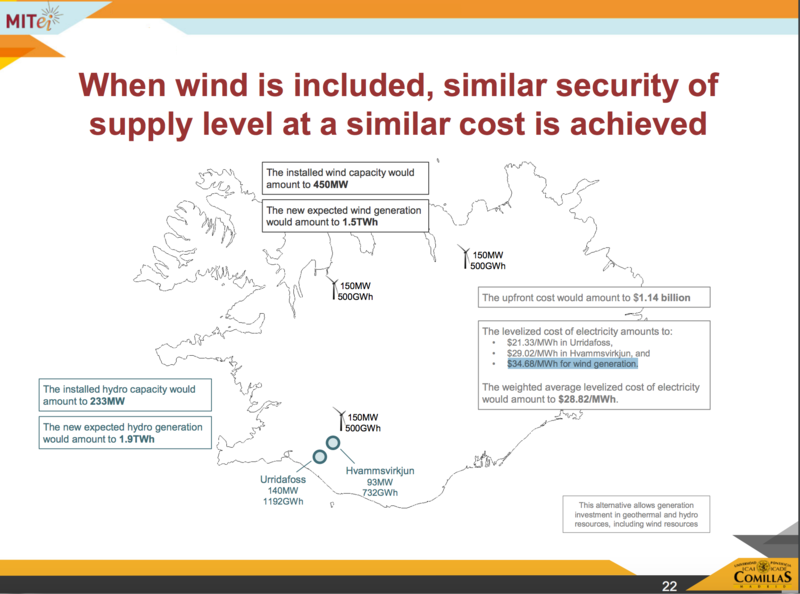 Claim no.2: Through bi-directional flows, IceLink could potentially reduce the cost of managing constraints between northern GB and the major consumption centres further south as energy is directed to Iceland at times of excess wind power generation in the north, stored in hydro reservoirs, and returned at times of lower wind output. 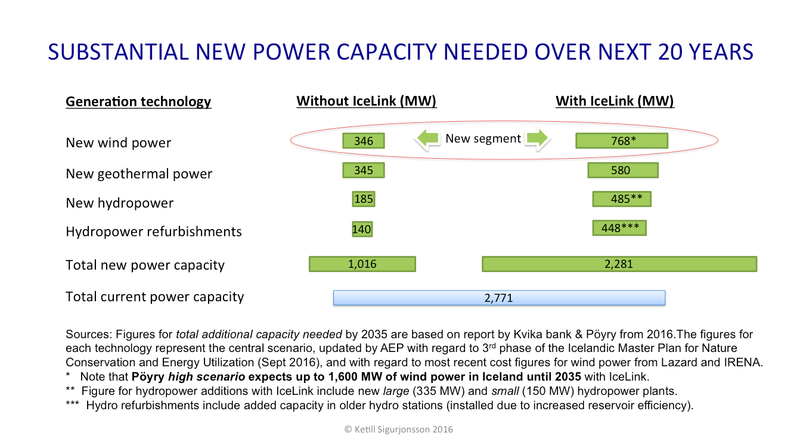 Correct: IceLink would open up the possibility to store for example Scottish wind power in Iceland’s reservoirs. Correct: During time of low wind in Scotland, Icelandic hydropower stations could be utilized to bring the wind power back to Scotland. Claim no.3: By providing flexible energy in near term spot markets and the balancing mechanism, IceLink can lower the cost of balancing, in particular in a system with a high penetration of intermittent generation. Possibly: There is a possibility that IceLink would lower the cost of balancing electricity supply/demand. However, this of course depends on several factors, such as the British capacity market. Claim no.4: IceLink connects currently isolated Iceland´s renewable electricity system with the broader European system and offers a means to decrease Europe´s dependency on imported fossil fuels in a cost efficient way. Correct, but not very relevant: IceLink is expected to offer the UK (and thus the European system) access to approx. 5,000 GWh annually. The current total annual electricity consumption in the UK is close to 335,000 GWh. Access to power generated in Iceland would thus only add a fraction to the current power supplied and consumed in the UK. Claim no.5: IceLink increases diversity of power supply at both ends and enhances further deployment of renewables through coupling highly flexible hydro generation with that of intermittent wind and solar generation. Correct: Iceland and UK utilize different sources for their power generation. While UK is mainly dependent on natural gas, coal and nuclear energy for its power generation, Iceland utilizes hydro and geothermal for close to all its generation. Moreover, most of the generation in Iceland comes from hydro. IceLink will thus indeed increase diversity of the power supply, and Iceland’s flexible hydro power is perfect to balance supply and demand while solar and wind power fluctuates. Claim no.6: IceLink delivers reliable and flexible energy into the GB system at times of thin supply margins. Correct: IceLink could indeed deliver reliable and flexible energy into the GB/UK system at times of thin supply margins. 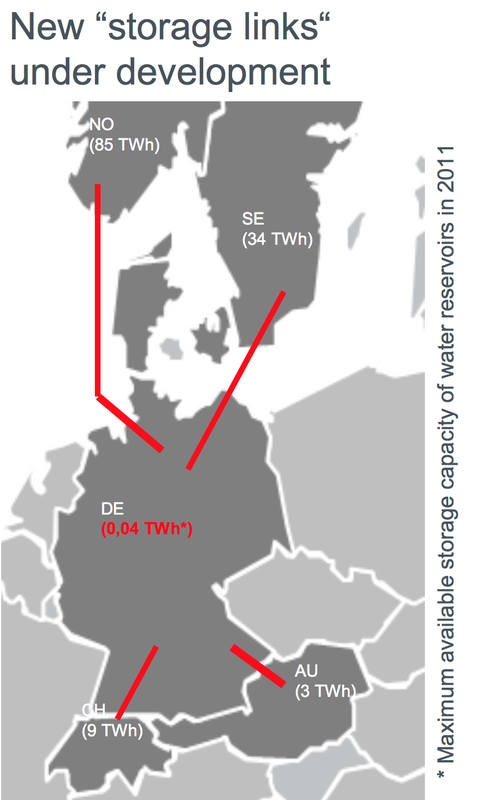 To better understand the importance of access to flexible hydropower, based on large reservoirs, we would like to refer to our earlier article; IceLink offers flexibility rather than base load power. 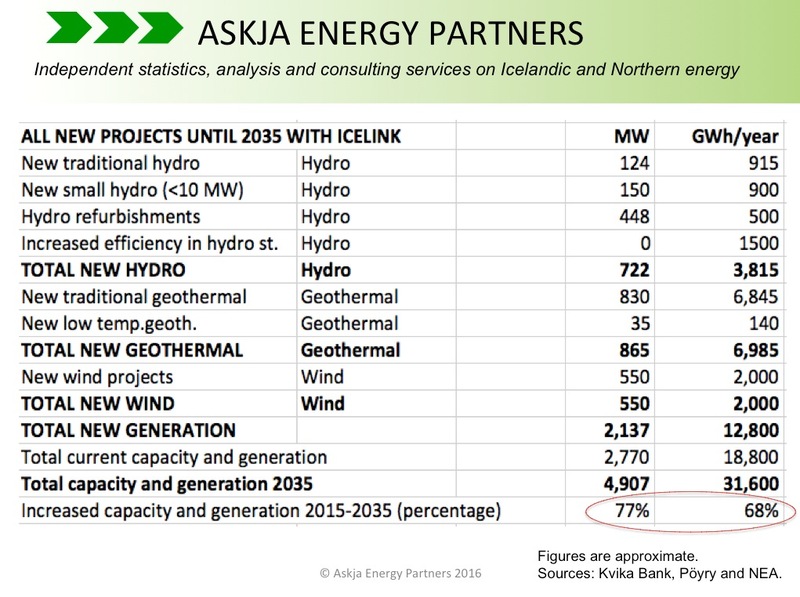 Claim no.7: IceLink allows energy to flow to Iceland at times of low hydro generation potential, e.g. due to unusually low precipitation levels. Correct: Every few years, the Icelandic reservoirs fill up quite late due to low precipitation or cold weather (resulting in low glacial melting). This decreases the efficiency of the Icelandic hydropower stations and adds a risk to the system. With IceLink this risk would become less. Claim no.8: Iceland generation is 100% renewable. The interconnector would provide an export opportunity for the surplus energy in the renewable hydro system that is not currently harnessed due to economical and operational limitations. Correct: The closed Icelandic electricity system is constructed in the manner of securing stable supply to heavy industries (especially to aluminum smelters, who need stable power supply 24/7 all year around). In years with unusually much precipitation or heavy glacial melting (warm periods), excess amounts of water runs into the reservoirs, resulting in overflow. Turbines could be added to harness this excess, but such development is costly and not economic unless having access to a market where power prices are higher than in Iceland. IceLink would create access to such a market. Claim no.9: The UK has committed itself to ambitious reduction of greenhouse gas emissions. IceLink contributes with its lower cost of low carbon energy compared to domestic marginal alternatives and its flexibility contributes to reducing the cost of enabling the integration of UK intermittent renewables. Correct: Even though the Icelandic geothermal,- hydro- and wind power sources are fairly limited when having regard to the enormous size of the British power market, it would make economic sense for the UK to buy Icelandic renewable power instead of for example more expensive British offshore wind power. For more on this subject, we refer to our earlier article; UK’s electricity strike prices positive for IceLink. And we can add that even though strike prices for new offshore wind power seems to be coming down quite fast, electricity from Iceland could be substantially cheaper than new offshore wind farms off the British coast. Claim no.10: IceLink involves the deployment of relatively mature low carbon technologies. As such, it allows GB to reduce reliance on particular domestic technologies, thereby reducing exposure to lower than expected cost reduction trajectories. Correct: Currently, almost all power generation in Iceland comes from mature geothermal- and hydro technology. In the coming years and decades the Icelandic power sector is likely to also start utilizing wind power on land – which is also a mature technology and less problematic than offshore wind power. The conclusion is that most of the claims set forward by Landsvirkjun, regarding IceLink, are not only correct but also very relevant. However, it is possible that the project could be delayed by Britain’s decision to leave the European Union. The following list explains what power projects are being considered in Iceland, according to the Icelandic Master Plan for Nature Protection and Energy Utilization. The projects have been cost analyzed (levelized cost of energy; LCOE), as described in a recent report published by the Icelandic Energy Industry Association (Samorka). Utilization category: The project is likely to be developed if/when there is power demand and interest by the energy sector. Projects on hold: More information and/or data is needed to decide if the project will be classified as Utilization or Protection. Protection category: The project is unlikely to be developed, due to environmental issues. The current classification is being reconsidered by the government However, it is the Icelandic Parliament (Alþingi) that takes final decision regarding how each project is categorized. This means that over time, project(s) may be moved from one category to another, based on a political decision by the Parliament. The following classification is up to date as of August 2016. Note that in Samorka’s report on the LCOE, the cheapest option, Norðlingaölduveita, is said to be on hold. In fact this option is currently in the protection category. * The project may be developed in a different way for less environmental impacts, resulting in lower generation. ** 45 MW station at Þeistareykir is already under construction, with the electricity sold (long-term contract). n/a Projects involving new reservoir for current power stations (turbines may be added, but not necessarily). nyca Projects that have not yet been officially cost-analyzed. The list above may change at any time and new projects not listed may be introduced and developed. Planned 45 MW wind power project of Biokraft in Southern Iceland is not included on the list. No planned power projects under 10 MW (mainly small hydro) are included on the list. Cost estimates do not include transmission or connection cost. The list is up to date @ August 2016. Iceland may offer numerous new renewable energy projects where levelized cost of energy (LCOE) is very low. Or as low as 22.50 USD/MWh. 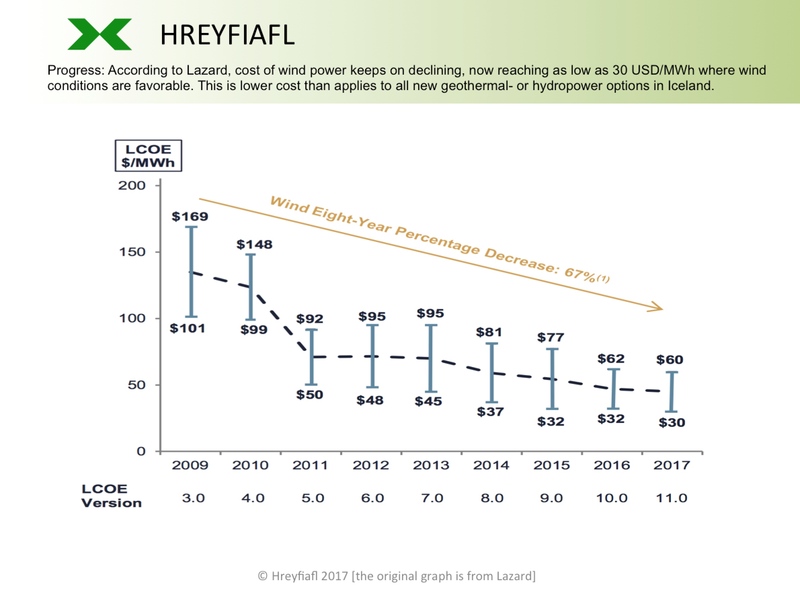 The weighted average cost (LCOE) for all new projects in Iceland needed to meet increased power demand until 2035, could be as low as 26.93 USD/MWh. This can be seen from a new report published by the Icelandic Energy Industry Association (Samorka). However, to realize such a low LCOE the Icelandic energy industry would have to be able to develop several projects that are currently not classified for development/utilization. When only taking into account projects already classified for utilization, the LCOE is substantially higher or 34.41 USD/MWh. Note that those figures are an estimation by contractors working for the Icelandic Energy Industry Association, and are based on cost-information from the Icelandic National Energy Agency (NEA). 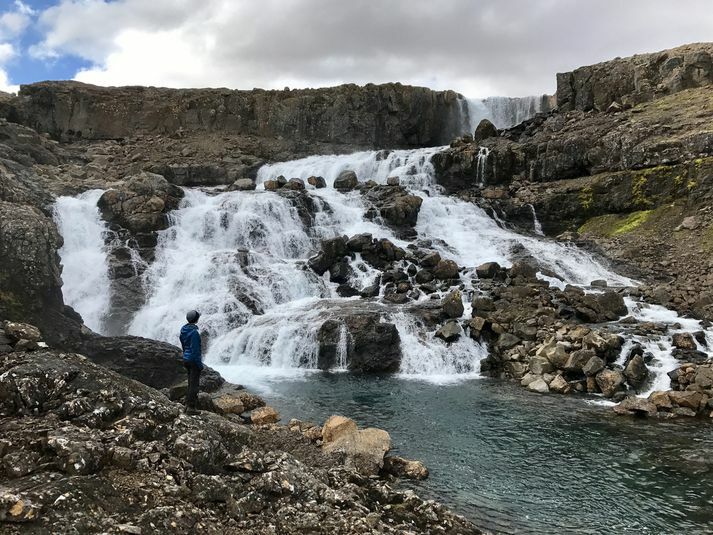 The Icelandic government has adopted a special Master Plan for Nature Protection and Energy Utilization, where possible new hydro- and geothermal power projects are classified into three categories. The categories are protection, on-hold, and utilization. Many of the possible new energy projects have not made it into the utilization category. The table at left lists the lowest-cost hydro- and geothermal power projects planned by the Icelandic government to be realized, currently classified in utilization category. Some of these projects have substantial higher LCOE than the lowest-cost projects not categorized for utilization. 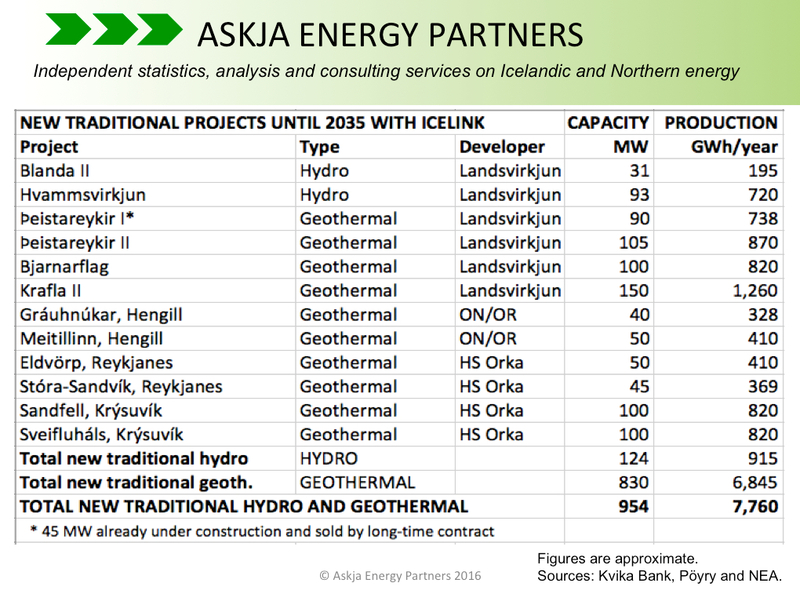 Note that the list is not absolute; for example the Eldvörp project may be developed before the Gráuhnjúkar project. As can be seen on the table, the weighted average LCOE for all projects already categorized for utilization, needed to meet increased domestic demand until 2035, is close to 34 USD/MWh. Which probably explains why Icelandic energy companies are now, according to sources within the industry, offering new long-term power contracts where the tariffs are as low as 34-35 USD/MWh (common unofficial starting tariff; the advertised tariff is 43 USD/MWh). Being able to offer new power contracts with a starting price close to 34 USD/MWh, may be quite competitive having regard to the international power market. However, Icelandic energy firms are eager to be able to develop projects that have even lower LCOE. Thus, the industry hopes to have several low-cost projects re-classified by the Icelandic parliament (Alþingi). To reach the lower LCOE of 26.93 USD/MWh, several projects need to be re-classified. Meaning low-cost projects that are now classified as protection or on-hold, would be re-classified as projects in utilization category. This is illustrated on the table at below. 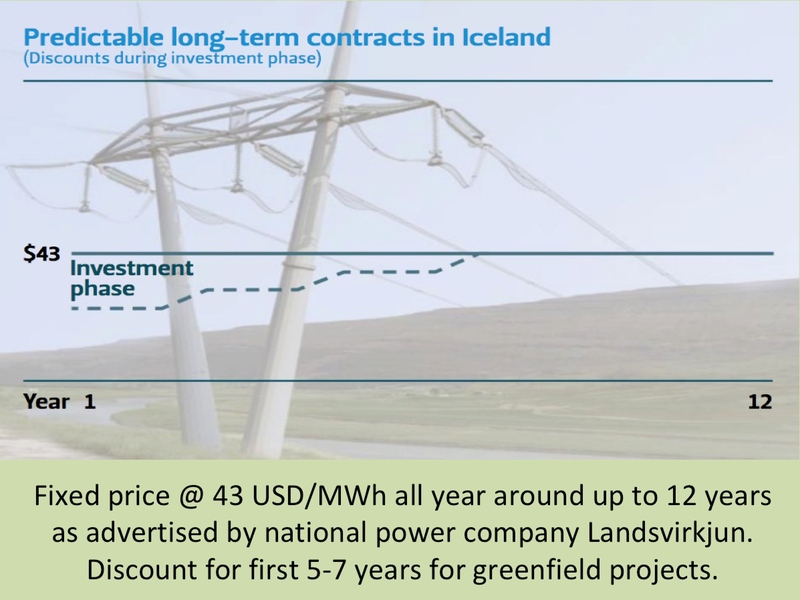 If the energy industry will be able to convince the Icelandic government and parliament to move certain possible projects from the categories of protection and on-hold, to the utilization category, the levelized cost of new generation needed until 2035 may drop from approximately USD 34 USD/MWh to close to only 27 USD/MWh (meaning almost 20% lower cost). So, the projects listed on the table at left can be said to reflect the wish-list of the Icelandic energy industry (the industry hoping to have all these projects listed for utilization). 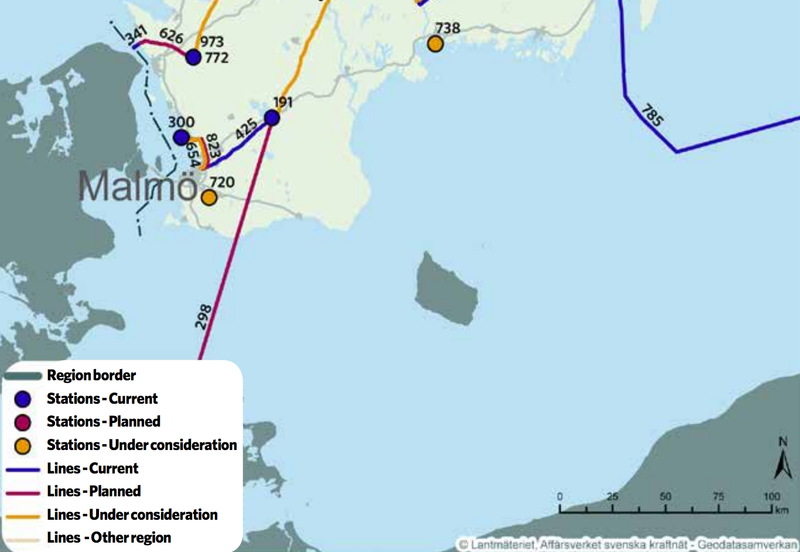 The two tables above also illustrate how different selection of projects affect the LCOE when/if the IceLink subsea power cable between Iceland and United Kingdom (UK) will be realized. If power will be exported from Iceland to UK, Icelandic generation naturally needs to increase more than without IceLink (as we have explained earlier here at the Icelandic and Northern Energy Portal). 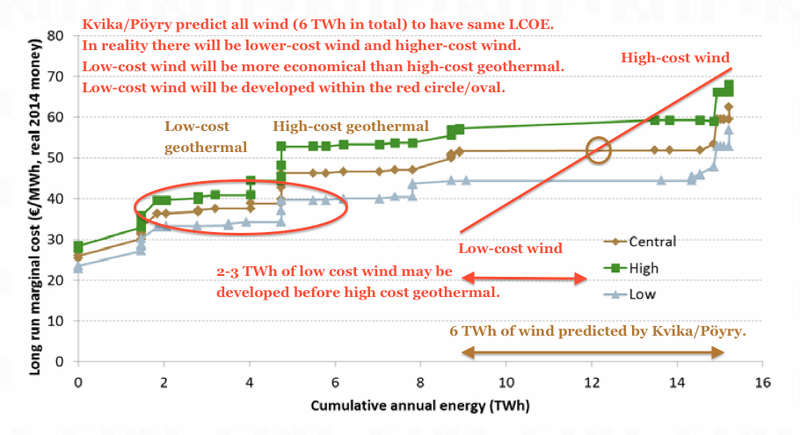 Depending on which projects will/would be developed with IceLink, the LCOE for new traditional hydro- and geothermal projects could be as low as 28.49 USD/MWh (note that the overall LCOE for all the generation needed for IceLink would be higher, as it is expected that close to 550 MW of wind power would also be developed in Iceland to fulfill the demand of the cable). 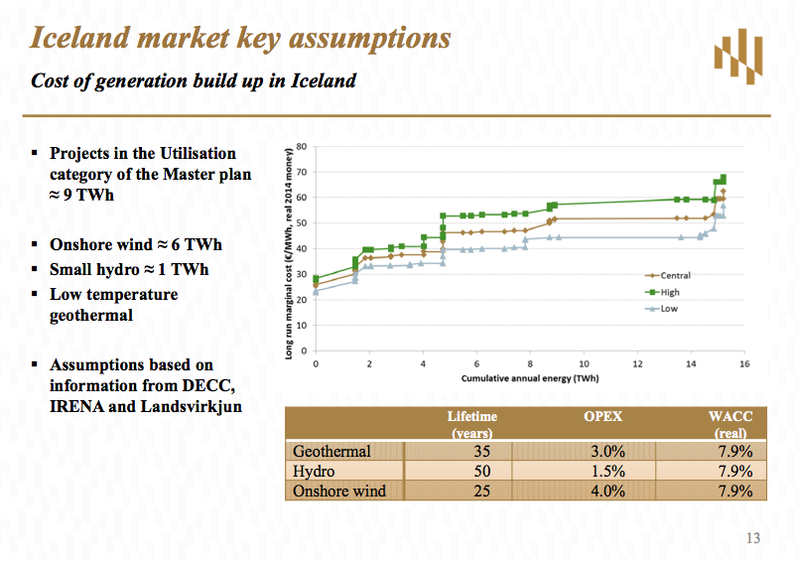 To reach such a low target for LCOE, 28.49 USD/MWh, the Icelandic energy industry would have to have its wish-list, as shown on the second table, accepted by the Icelandic authorities. Having regard to projects currently categorized for utilization in the Master Plan, the LCOE will be much higher (with IceLink) than the said 28.49 USD/MWh. The LCOE for new traditional hydro- and geothermal stations currently categorized for utilization and needed for IceLink, is expected to be 37.21 USD/MWh (as can be seen on the first table above). Which is close to 30% more than the low-cost options on the wish-list. Thus the Icelandic government and politicians now face difficult and controversial decisions how to balance the economics and environmental issues, when deciding if changes will be made to the Master Plan. It is expected that a new version of the Master Plan may be adopted by the Parliament (Alþingi) even before the end of this year (2016). If IceLink subsea HVDC power cable will be constructed, it is expected that totally 954 MW of new traditional large hydro- and geothermal plants will be needed in Iceland. These power plants would be constructed during the next two decades. According to the Icelandic Master Plan for Nature Protection and Energy Utilization, the Icelandic government would most likely fulfill the increased demand by permitting the development of twelve new large hydro- and geothermal projects (as listed on the table at left). These are two hydropower projects and ten geothermal projects (or nine projects if Þeistareykir I and II would be defined as one project). 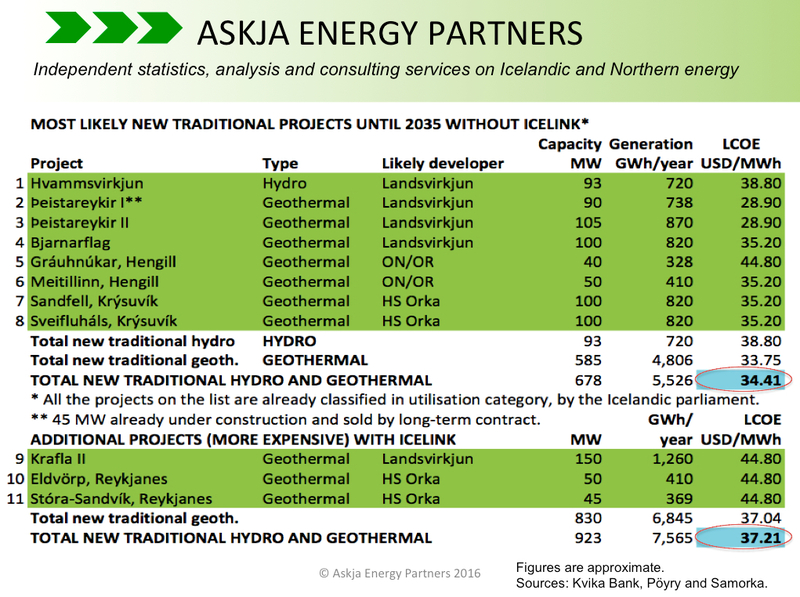 The ten geothermal projects are Þeistareykir I and Þeystareykir II in NE-Iceland, Bjarnarflag and Krafla II in NE-Iceland (Krafla I was constructed almost 40 years ago), Gráuhnúkar and Meitillinn in the Hengill geothermal area in SW-Iceland, Eldvörp and Stóra-Sandvík on the Reykjanes peninsula in SW-Iceland, and Sandfell and Sveifluháls in the Krýsuvík area in SW-Iceland. 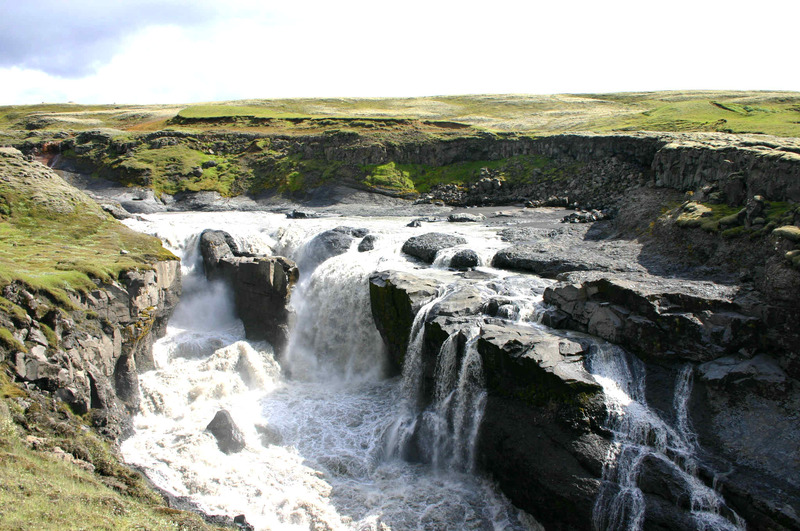 The two hydropower projects would be Blanda II in NE-Iceand and Hvammsvirkjun in Þjórsá in S-Iceland. All these twelve projects are already defined in utilization-category in the Master Plan for Nature Protection and Energy Utilization. 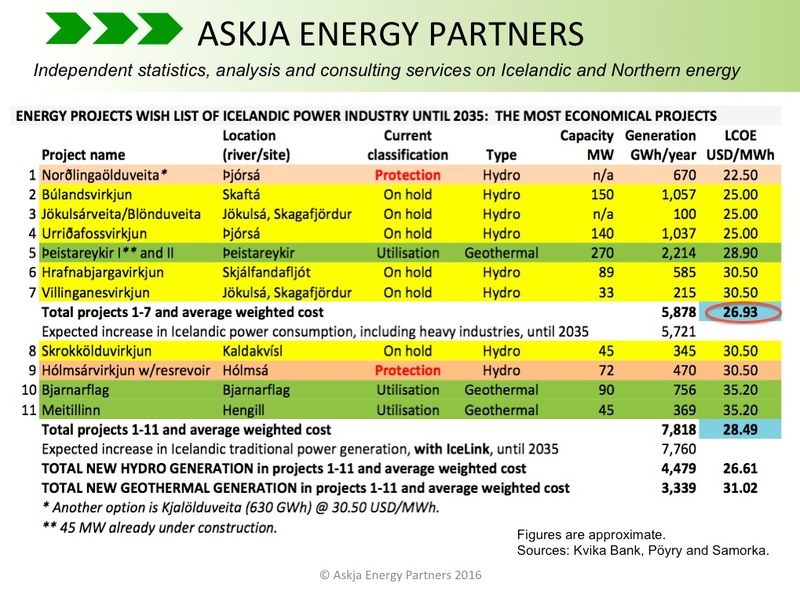 However, some of these projects are somewhat costly to develop when compared to all possible energy projects in Iceland (which means there are several cheaper options available, although today they are not classified as utilization-projects, by either classified as protected or on hold). Recently, the Icelandic Energy Industry Organization and some of the power companies in Iceland started pushing for changes of the Master Plan, to have the Icelandic government and the parliament (Alþingi) to include several other lower-cost projects in the utilization-category (we will soon explain the cost-issues further, here at the Independent Icelandic and Northern Energy Portal). As several of the cheapest options for harnessing more hydro- or geothermal power are in environmentally sensitive areas, there will without doubt be strong opposition against major changes of the Master Plan. 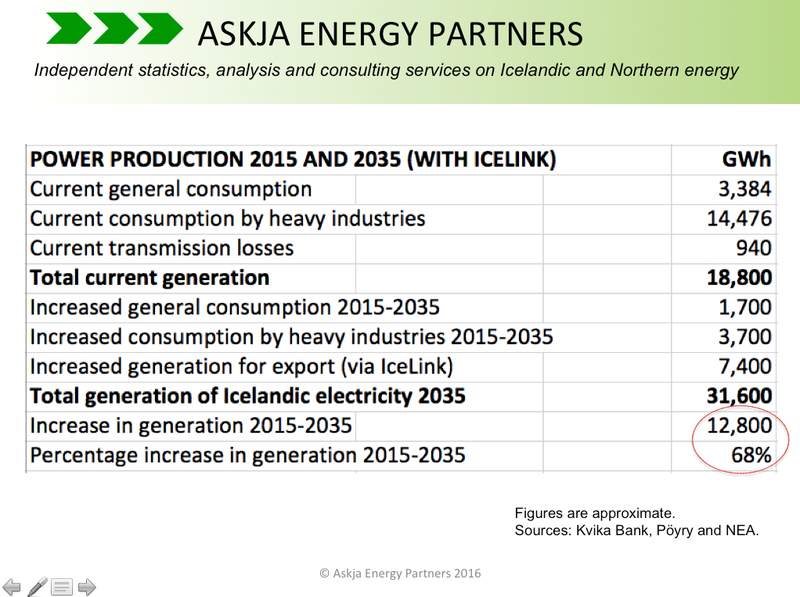 If/when the IceLink project will go through, the total Icelandic power generation will have to increase enormously. Most of the new generation, or 7,400 GWh of the total increase of 12,800 GWh in annual production. would be added as exported power to the UK. In this same period (2015-2035) Icelandic general consumption of electricity is expected to increase by 1,700 GWh and power consumption by heavy industries in Iceland is expected to increase by 3,700 GWh. In total, Icelandic electricity generation would thus increase 68 percent in the period 2015-2035. For more on this subject, we refer to the table at left, and our earlier post from last July 22nd. A subsea HVDC power cable between Iceland and the United Kingdom (UK) would call for proportionally extreme increase in Iceland’s generation capacity. According to a new report by Kvika Bank and Pöyry, Iceland needs to build new power capacity of 2,137 MW to supply both the cable and the domestic demand. The figure for the necessary new capacity for the cable only is expected to be 1.459 MW (as shown on the table below). The rest of the new capacity is to meet expected increase in domestic demand for electricity (until 2035). The cable is normally referred to as IceLink. 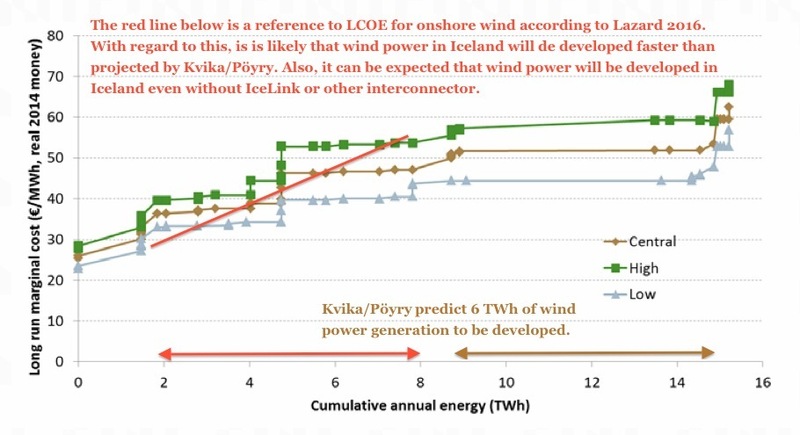 The report by Kvika and Pöyry (available in Icelandic only) claims that high proportion of the needed new capacity for IceLink can be met with wind power (today Iceland has very small wind power industry, as new geothermal- and hydropower projects have been the least costly way to generate electricity in Iceland). 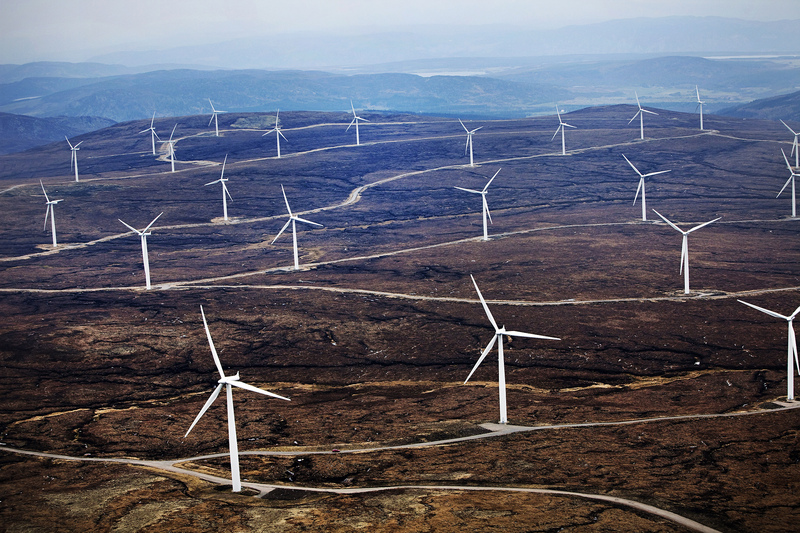 The authors of the report expect that 550 MW of new wind power would be constructed to meet demand by the cable. The second largest increase in Icelandic power capacity would be in the form of hydropower refurbishments (which would probably mostly be new turbines in current hydropower stations). This figure is expected to be 448 MW. However, the report does not explain in a clear manner how these refurbishments would be carried out. From the report it is also somewhat unclear why it is believed that 550 MW of new wind power will be a good opportunity for the business case – instead of for example somewhat less wind power and somewhat more hydropower. Substantial part of the expected new Icelandic capacity until 2035 would come from new small hydropower stations. Such new small hydropower stations, each with a capacity less than 10 MW, would in total be close to 150 MW. 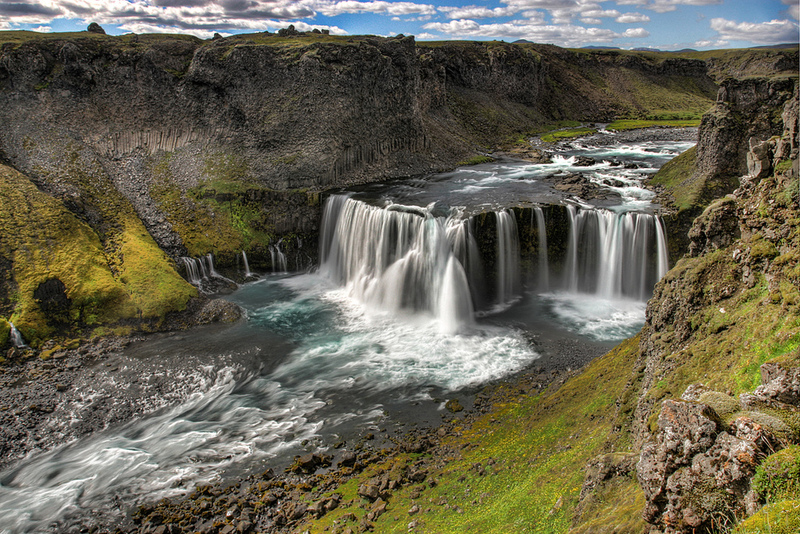 This would probably mean dozens of new small running-river hydropower projects in Iceland. 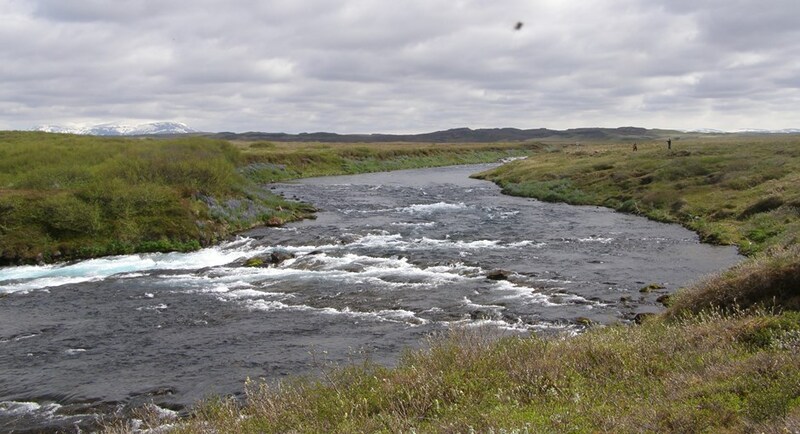 Such projects tend to be more costly than the traditional large Icelandic hydropower projects. However, high strike price for the electricity make such expensive projects financially viable, according to the report. According to the report, 276 MW of new traditional hydro- and geothermal power will be needed to meet demand from the cable. Most of this capacity will be in geothermal (245 MW). When also taking increased domestic power demand into account, the total new traditional hydro- and geothermal capacity needed by 2035 is expected to be 954 MW; 124 MW in traditional large hydropower and 830 MW in traditional geothermal power. Today, Iceland has 665 MW of geothermal power (and 1,986 MW of hydropower). So the expected increase in utilization of Icelandic geothermal power is quite enormous. 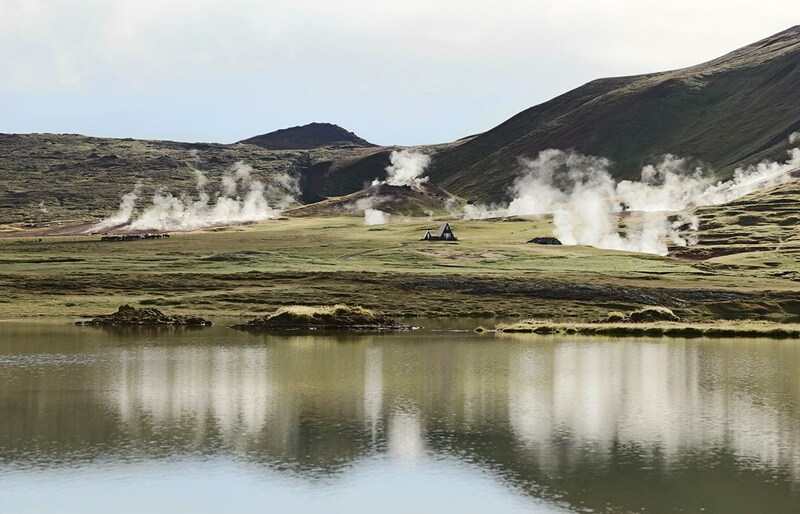 It should be noted that figures on traditional hydro- and geothermal power projects in the report are based on the Icelandic Master Plan for Nature Protection and Energy Utilization. According to the report, considerable part of the new Icelandic power capacity to be developed is to meet expected increased demand from heavy industries in Iceland. Today, heavy industries in Iceland (which are mostly aluminum smelters) consume close to 80% of all electricity generated in the country. 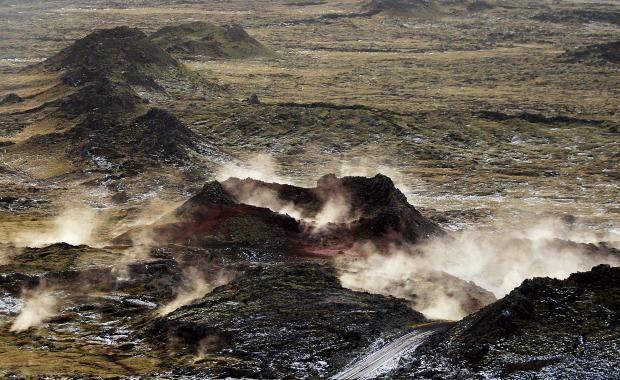 According to the report by Kvika Bank and Pöyry on IceLink, all the three aluminum smelters in Iceland will continue their operations in the coming years and decades. And the authors of the report expect that in the coming years and decades power demand of heavy industries in Iceland will increase. It is noteworthy that such assumptions could change dramatically, if for example one of the aluminum smelters in Iceland would close down. 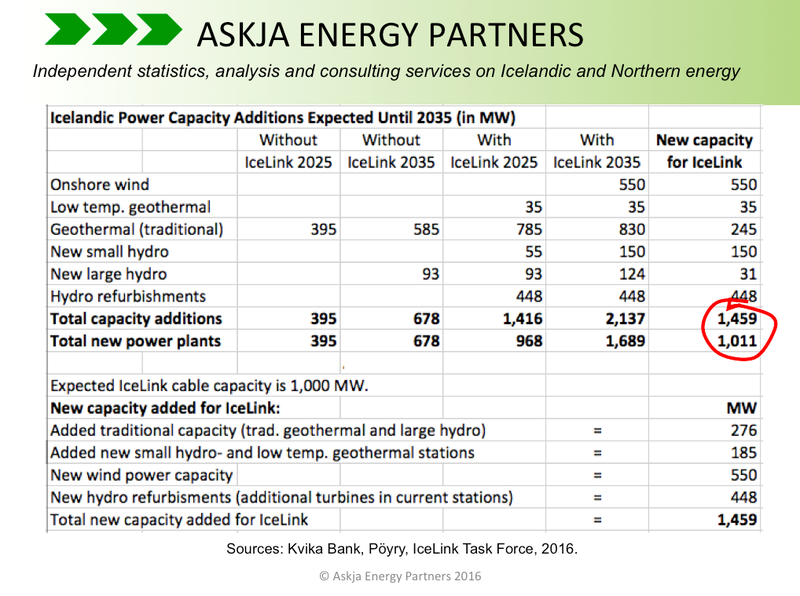 Finally we should mention that if/when IceLink will be constructed, it is expected that the total increased power capacity in Iceland will be around 77% (increase from beginning of 2016). The increase in generation will be somewhat more or close to 68%. According to the above mentioned report, all the projects to meet this increase will be developed in the next 15-20 years. We will soon be revisiting this subject, explaining in more details what power projects will be needed to meet this high increase. Obviously such an increase will/would make Iceland’s position as the world’s largest electricity producer even more pronounced.